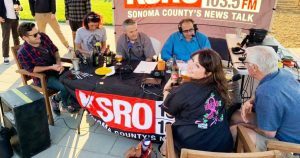 Today Brew Ha Ha is live at the Russian River Brewing Company in Windsor, California, to celebrate the grand opening of their new facility. 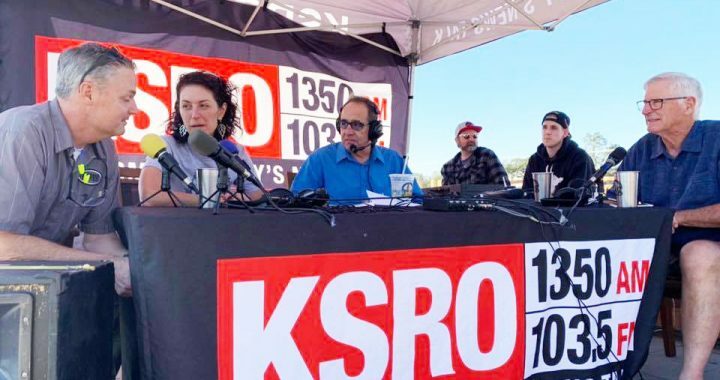 Owners Natalie and Vinnie Cilurzo and director of sales Michael Benz join Steve Jaxon, Mark Carpenter and Herlinda Heras on the show. Michael Benz is serving some Pliny that is all of 30 seconds old, straight off the bottling line. Steve says this new place is Mark Carpenter heaven and Mark agrees. Russian River Brewing Company has just opened its big new brewery in Windsor. Mark admires that they have built the brewery to do open fermentation. He describes how most brewers use closed tanks and the beer is fermented and stored in there. Russian River Brewing Co. is one of the few who use this other technique, where the beer is fermented in one open tank and then moved to a cellar tank where it aged, then on to the customer. Mark says brewers don’t want to use this method because it’s more work, but Mark used it at Anchor and he prefers it. You can look at it and smell it. He tells about seeing their new round fermenters where you can see and smell the yeast. Brew Ha Ha at Russian River Brewing Co. in Windsor. L-R, Michael Benz, Natalie & Vinnie Cilurzo, Steve Jaxon, Herlinda Heras, Mark Carpenter. Vinnie goes on to tell how the best, happiest yeast is at the top. They measure the viability of the yeast, the higher the viability the stronger and healthier it is. Most breweries get 90% viability, while at Russian River Brewing, their yeast is so healthy they get 98% viability, which he says makes better beer. Vinnie talks about a how he appreciates that the yeast is alive. He also talks about the new “super clean rooms” in the brewery, with 100% HEPA filtered air, then run through a UV lamp so the air is ultra sterile. Mark Carpenter started at Anchor Brewing in 1971 and retired a few years ago. Steve asks him to compare how brewing has changed, from then to the scene today. Mark says that he and others used to go to Europe to learn about brewing. Now the Europeans are trying hard to do American styles and America has become the brewing leader. Vinnie bought their brewhouse from a German manufacturer, and their technicians are also visiting the show today. Mark says they are lucky in Sonoma to have so many local brewers making good beer. When he went to Europe recently, the beer wasn’t always good there, but here, if you’re not making good beer, you won’t be around for long. Vinnie also tells about visiting Europe to study production and found that in Germany, they stick to their Pilsner, Helles, Dunkel, Wheat Beer and Merzen. But he says now they are also making IPAs and other craft beers there, following the lead of American brewers. Vinnie goes on to tell how beer is a commodity in Germany. But now they are making “craft beer” and have taken the lead from us, making styles that we pioneered. It all started with Fritz Maytag and Anchor Brewing. Vinnie says he made a batch of Barleywine recently for the first time in ten years. Mark tells how Fritz Maytag saw some Barleywine, which some ladies were drinking. Herlinda says it’s thick and unctuous and dark. Mark remembers how Fritz came back and said they were going to make a Barleywine at Anchor. He noticed that they had names and someone at Anchor named their Barleywine “Old Foghorn” Vinnie’s will be called Old Gibeldygotch. The name comes from his father in Syracuse, New York. 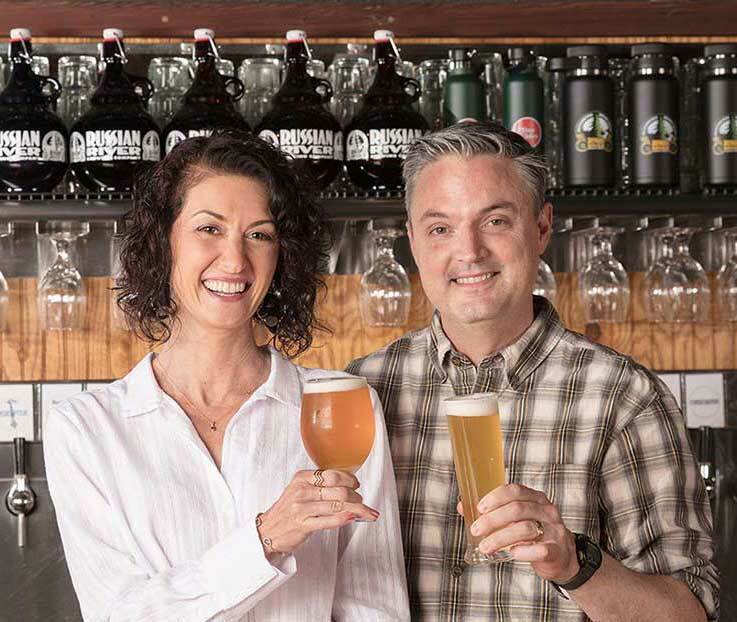 Mike Benz talks about his approach to sales as director of sales for Russian River Brewing Co. 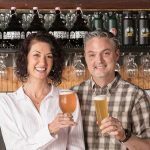 They are looking to build their network of distribution slowly and deliberately, first taking care of those who have sold their beer at retail and who often would run out; first they will make sure that they have a little more beer for their shelves. Natalie explains how their sales operation is set up, so they can focus on their core strengths which are bringing people to them and giving them “the full Russian River experience.” They distribute in California, Oregon, Colorado and Philadelphia, to places that are good craft beer stewards, who appreciate having their beer and take good care of it. Mike met Vinnie and Natalie on a hop farm in Yakima, Washington, Segal Ranch. Mark Carpenter also used to acquire hops there for Anchor Brewing. John Segal is an old friend of theirs. Mark bought hops there for Anchor and also from John’s father, whom Mark says is the brother of George Segal the actor. 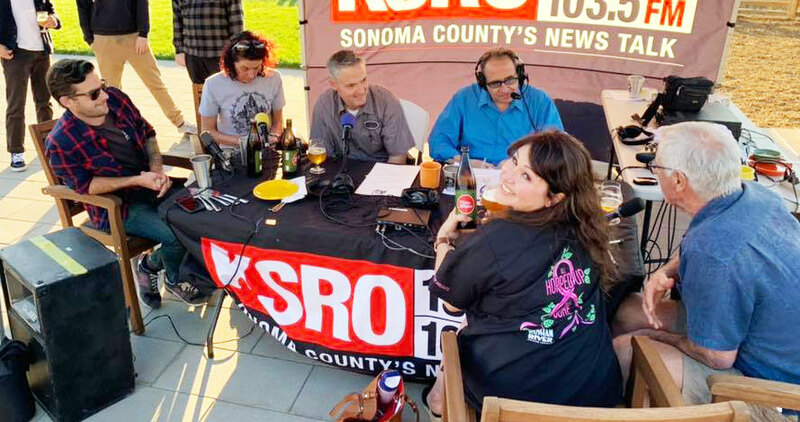 Herlinda asks Vinnie if they will still make a beer named after the hop harvesting machine Dauenhauer, which was invented in Sonoma County. Steve mentions that Sonoma County was famous for hops for a long time. Vinnie says it still is, and mentions the Norcal Hop Growers Alliance, who have been featured on Brew Ha Ha . He also buys hops from Redwood Hill Farms who have also been on this show. Vinnie tells about how there are lots of small acre and half-acre hop farms around Sonoma County now. Mark says it’s a big investment growing hops. Vinnie says they use all wet hops, picked and used fresh. It’s like the difference between cooking with dry or fresh Basil.